Combine escalloped apples and dried cherries in small bowl. Unfold puff pastry sheet; cut into four equal squares. Spoon 1/4 apple mixture onto center of each square. 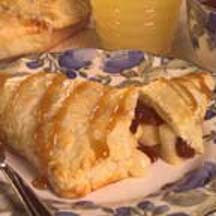 For each turnover, fold one corner of dough over filling to form triangle; crimp edges of each turnover with fork to seal. Place turnovers on a baking sheet.